Programmable thermostats offer savings and convenience. Stop paying for heating and cooling while no one is home to enjoy it. 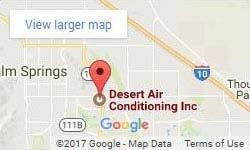 Desert Air Conditioning helps Palm Springs get out of bed easier with a pre-warmed or pre-cooled house. Save on business expenses by not heating or cooling large spaces when no one is using them. All this is possible with thermostats in Palm Springs installed by our air conditioning contractor service. Savings – Turning your thermostat back 7 to 10 degrees for the eight hours a day you are likely out of your home can save up to 10% on heating and cooling costs. Both businesses and individuals can save by not heating or cooling spaces while they are not in use. Convenience – You can program your home or office to be the temperature you want, when you want it. Start cooling your home a half hour before you return from work. Bring conference rooms to the perfect temperature before your clients arrive. Thermostats allow you to set it and forget it. Consistency – Assuage those family arguments and settle on one setting. You can set your in-home thermostat to your desired temperature for each season and each part of the day, then leave it knowing your home or office is set for your ultimate comfort. needs. An HVAC Contractor can come to your home or business and make suggestions based on the size of the space and your specific heating and cooling preferences and habits. Our knowledgeable team is happy to go over the many options with you, helping you narrow down the right one for your needs. We have a large range of price-points, so there is there is something to fit any budget. Don’t continue to pay for your heating and cooling while no one is inside. Don’t sacrifice your perfect temperature because your utility bills are too high. Save money with a programmable thermostat in Palm Springs and keep your home or office the temperature you want. Got an old, outdated, or broken thermostat? We can remove the old one and replace it with a more efficient, modern system. We can even set up and teach you to use a wireless or wifi thermostat you can control from your smart phone. We carry the best brands with the longest warranties. Our expert installers can place the thermostat where it is most convenient for you. We stay on to teach you how to use it. If you have questions after we leave, you can always feel free to call. We are happy to support you while you learn to use your new thermostat system. Contact us today to talk about thermostats in Palm Springs and the surrounding areas. We also do furnace repairs, installation, and more.